Nobel Prize-winning novelist Gabriel Garcia Marquez agreed to return Wednesday for the first time in a quarter century to the banana-growing birthplace that inspired much of his literature. Garcia Marquez, who lives most of the year in Mexico City, will arrive in his hometown of Aracataca by train, part of a new passenger service Colombians hope will carry thousands of literary pilgrims in the coming years. "Garcia Marquez has promised to visit the town and wants to do so in a train," Carmen Saade, secretary of culture for the state of Magdalena, which organized the visit, told The Associated Press. A crowd of singers, Garcia Marquez family members and Colombia's culture minister are joining the rail trip from the Caribbean coastal city of Santa Marta. Students holding yellow balloons - for the yellow butterflies that inhabit his work - are expected to greet them Wednesday afternoon. 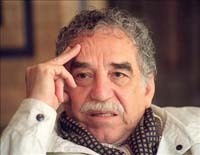 Garcia Marquez last visited the town in 1983, a year after winning the Nobel Prize for literature. In his 2002 autobiography "Living to Tell the Tale," Garcia Marquez described how, as a struggling journalist in the 1950s, a return trip to Aracataca with his mother inspired him to become a novelist. Last year, residents voted overwhelmingly in a special referendum to change the town's name to "Aracataca-Macondo," but high absenteeism invalidated the results. Garcia Marquez is likely to visit the home where he was raised by his grandparents. For his 80th birthday in March, Colombia's government pledged US$500,000 to reconstruct the decrepit home, where a museum now functions.